Yes, an entire week later and I am still very much in the clutches of my three handsome English werewolves. It seems that, while I thought that I might make my escape more swiftly, they had other plans in the meantime. Still, I managed to elude the first of them last night, and today? Both the wer and the wulf aspects of Number Two are both fully complete. 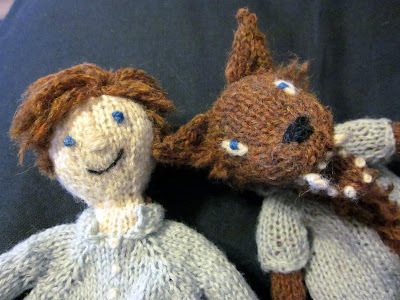 Here he is, The Clerkenwell Kid in woollen form, alongside his woolly lupine alter ego. This, of course, was taken prior to their Joining - a messy undertaking much like any other surgical procedure - hence the lack of photographic documentation. Still, together or apart, I daresay that both halves turned out quite cute, and I am truly hard-pressed to decide which of the two I favour more. Perhaps the wulf? I always did have a thing for chest hair and he is sporting quite the pelt indeed! Some of you have been asking if the pattern is one of mine and (unfortunately) it is not - though I wish it was as it is completely, utterly brilliant! It's by Annie Watts and you can find it on Ravelry here. Simple in its complexity and complex in its simplicity both at the same time - I can't say enough about this one. LOVE. November 22, 2011 at 3:13 p.m.
November 22, 2011 at 3:39 p.m.
November 22, 2011 at 11:13 p.m. The wulf is so very cute!!!! November 23, 2011 at 8:11 a.m.
November 25, 2011 at 11:59 a.m.
Jane runs on clean-burning tea + yarn. Earl enjoys apples, nuts + sweet potatoes. Simple theme. Theme images by enjoynz. Powered by Blogger.